Elvis Costello, Sheryl Crow, Georgie Fame And Van Morrison are amongst the first names announced for BluesFest 2014 taking place at the Royal Albert Hall, London between 26th and 31st October. It’s said to be the UK’s only major festival celebrating Blues, Soul & Roots Music and will take place over an extended six day period this autumn. Now in its fourth year, BluesFest made history in 2013 when it relocated to the Royal Albert Hall and became the iconic building’s first ever full-scale music festival. The four day event was a resounding success, with over 40,000 music fans enjoying a run of shows from the likes of Robert Plant, Ronnie Wood, Bobby Womack, Van Morrison, Gregory Porter, Tedeschi Trucks Band, Mavis Staples, Chris Rea and many more. This year’s festival will feature a similarly world-class line-up as evidenced by the first batch of headliners, which includes the return of Van Morrison (28th Oct), songwriting icon Elvis Costello (28th Oct), the inimitable Georgie Fame (who opens for Costello on 29th Oct), multi-Grammy-winning Sheryl Crow (31st Oct) and chart-topping jazz funk outfit Level 42 (26th Oct). Although all these artists are now celebrated for their own distinctive sounds and styles, they all credit the blues as the start of their musical journeys. 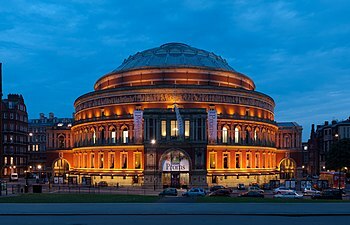 BluesFest will use all of the Royal Albert Hall (Photo credit: Wikipedia). As was the case with last year’s festival, BluesFest 2014 will be hosted exclusively at the Royal Albert Hall, with performances taking place not just in the main auditorium, but also in other rooms around the building during the daytime, utilising the Grade 1 listed venue’s varied selection of performance spaces. Alongside the headline concerts in the main auditorium each evening, some of the additional daytime activity introduced in 2013 will return including intimate sessions from festival artists, exclusive exhibitions, showcases, and an ‘In Conversation With’ series. This year’s festival runs from Sunday 26th – Friday 31st October. Tickets go on-sale 9am on Friday 4th April priced from £20 upwards (subject to per-ticket charge plus order processing fee) and are available from www.livenation.co.uk or www.ticketmaster.co.uk or www.royalalberthall.com. You can also call 020 7589 8212.